Michael Rosen's joyful 1989 story, We're Going on a Bear Hunt, returns to the West End. This smash-hit production features a lively score and is running at the Lyric Theatre for a strictly limited period. Create memories that your children will cherish forever with a trip to the show. This vivid and noisy fun-filled adaptation from director Sally Cookson and composer Benji Bower is guaranteed to excite your little ones. Join the intrepid family of adventurers and their musical dog on a quest to find a bear! Expect catchy songs, interactive scenes and plenty of hands-on adventure as the family wade through the gigantic swishy swashy grass, the splishy splashy river and the thick oozy, squelchy mud before coming face to face with a bear in its cave! This meeting causes panic and they run home followed by the bear. Finally, the children lock the bear out of the house and hide under a duvet. However, the ending might surprise you, it’s different from the book! LOOKING FOR CHEAP WE'RE GOING ON A BEAR HUNT TICKETS AT THE LYRIC THEATRE? With our huge range of cheap kids theatre tickets, London shows have never been better value. 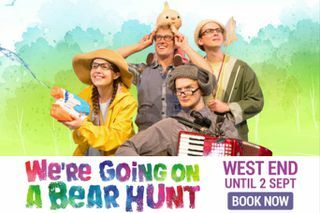 Book with us for We're Going On A Bear Hunt and enjoy great entertainment at a price that’s in tune with your budget. We're Going on a Bear Hunt is not available to book, please sign up to our newsletter for updates and offers on forthcoming and available shows. Where is We're Going on a Bear Hunt?